Grande Cheese (pictured above) – Stuffed with 4 of our finest cheeses; Ricotta, Provolone, Romano and Parmesan. 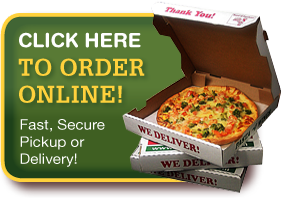 Pepperoni (or 1-Topping) – Pepperoni (or any other topping of your choice) combined with Ricotta and Provolone cheese. Carne Roma – Meatballs, Italian Sausage and Pepperonis abound in this calzone! Ricotta and Provolone cheeses are added to enhance the flavor. 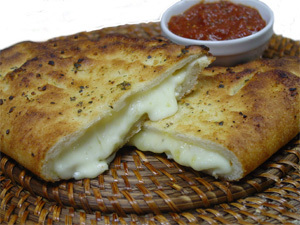 Italiano – This calzone has it all! Ham, Salami, Pepperoni, Banana Peppers, Onions, Tomatoes, Ricotta and Provolone cheese. A splash of our homemade Italian dressing completes this calzone.